New Enviro-Flo II Trench Drain Series Makes Installation Faster and Easier - Jay R. Smith MFG Co. There are any number of reasons why you might find yourself working on a construction project with a tight timetable. Unexpected issues popping up are part of any project. But one thing is certain--you’re going to have to go with the flow. Figuring out ways to move the project along faster while still adhering to the highest of standards is nothing new for you. Products that help you save time on installation and move the project forward are vital. Just this month Jay R. Smith Mfg. Co. released our Enviro-Flo II trench drain series. The Enviro-Flo trench drain system is one contractors have come to love for its ease of installation. The Enviro-Flo II builds on that simplicity even more. Contractors faced with a tight timetable will appreciate the Enviro-Flo II series trench drain’s new features. The Enviro-Flo II is constructed from lightweight environmentally friendly materials that are easier to cut and make connections on the job site. Its tongue and groove connections ensure a more uniform joint and can be pre-assembled easily which cuts down on installation time. Contractors now have a choice between the integral rebar mounting system or the Rante Arrow support. The rebar mounting system uses rebar or other job site materials to support and hold channel ends together before the pour. This allows for some vertical and horizontal adjustment as well as secure anchoring for monolithic concrete pour. The optional Rante Arrow support expands the range of vertical and horizontal adjustability (1” side-to-side adjustment) of the run after the trench drain has been installed and before the pour. One person can install the entire system, and its built in leveling device needs only a wrench to adjust the channel height. 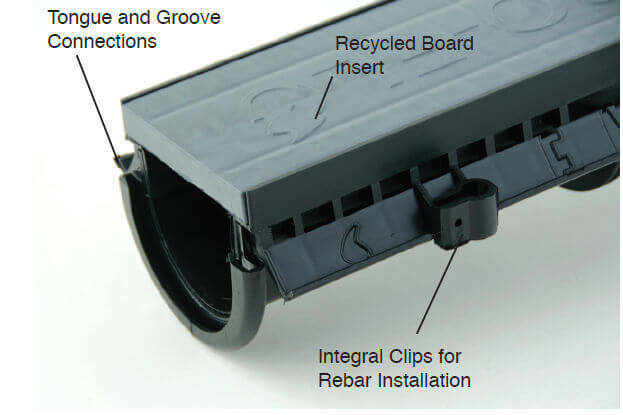 For added labor and material savings the integral no-hub outlet is molded standard onto each channel. Contractors will also appreciate the optional outlet adaptor which can be installed anywhere on the run for additional flexibility without needing any securing screws. If you find yourself in a situation where you have a tight construction time line or just want to save labor costs with a trench drain system that is easy to install consider the Enviro-Flo II Trench Drain Series. For more information on Enviro-Flo II and other Smith products, visit www.jrsmith.com.